One of the best things about working on AOA is that we get the chance to meet a lot of interesting people. We'll be highlighting a handful of them between now and the start of 2011. Sebastien came to the Capital Region from France in 2001. Two years ago, he picked up photography as a hobby. Since then he's taken great pictures of everything from the Santa Speedo Sprint to Larkfest to fireworks, to Central Warehouse. (His photos of the warehouse became a part of the story when the massive building caught fire this past fall.) This year he held his first photography show and started a blog to showcase his photos. Sebastien took some time away from his holiday in France to tell us a little more about the guy behind the camera. 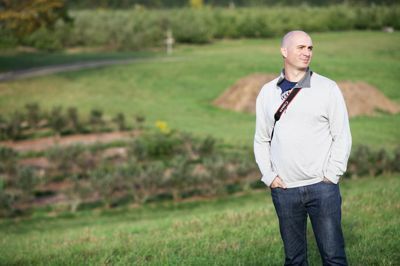 What do you do when you're not taking fabulous photos of the Capital Region? In 2001 I had just finished a PhD in biomedical engineering and an open-source software company I had known for a while offered me a position in Clifton Park. The market in France wasn't so exciting at the time and I needed some fresh air. Rumor has it I was kicked out for my shameful lack of interest in French cheese. The company is very successful. We are working hard developing scientific visualization, computer vision, medical imaging, data publishing and software process solutions (and yes, we are hiring). I am still working with them, sharing my time between biomedical and web apps. This country is my home now, I bought a house in Center Square in 2005; a great neighborhood if you ask me, except for the infamous mouse. It's a hobby. I hope it will never become serious enough that it stops being fun. I bought my first semi-pro camera two years ago, I didn't suspect I was going to press the shutter button about 40,000 times since then. Maybe I'm a photo hoarder. Damn, I hope I never end up on a show on TLC. I knew I had an affinity for specific subjects, such as performances, architecture, trips, the occasional parties, but I certainly discovered new ones. like buildings. I'm also taking pictures for my people at home, my parents, my younger sister, and some old friends. There are a few misconceptions about the US, so I try my best to share a small slice of this country the way I experience it. I started the accompanying blog much later on to bring a bit more commentary, and to make sure my mother doesn't think my life is just one giant hot air balloon ride from a soup swap in a Speedo to a gay pride parade in an abandoned factory full of crazies covered in mud. Why did you and Bennett do the urban decay tour? What is so interesting about things that are falling apart? A different group of talented people, who like to be much more secretive than I am, sparked my interest in urban exploration. Bennett, a close friend of mine, was rekindling his love for photography and he joined his hatred for pigeons to my love for asbestos pretty quickly. Speaking for myself, I'm from old Europe. I grew up surrounded by very old houses and the occasional ruin. This is something I miss, the weight of time, the way it alters what's around us. I like to look at an abandoned building as a lost vessel that holds memories. Most of the time such buildings survive us, laughing at a fire, even. Occasionally they fall hard and are reclaimed by nature or man. I'm writing this email from France, sitting in a 600-year old cold, cold house. It is difficult not to feel small in that respect, yet thankful to share the same historical space as so many generations before (and giant spiders). The US is a younger country but I'm certainly interested in learning about it. I guess visiting these old buildings is my way to get closer to local history, in the flesh. Many of the places we visited feel like they had been occupied a week before. Chairs, desks, files, toys, folders, a can of soup, a last cup of coffee -- a lot was left behind. These objects are now self-sufficient. They exist without us and there is a quality to that. I like to wonder who left them, too. Why was it so sudden? Who was the last person to flip the switch and how did he feel about it? I try to provide a glimpse into this world of chaos and decay before it inevitably gives way to something completely different old or new. Every now and then it echoes far and wide and we receive touching comments from people who inhabited these places. The Starlite Theather in Latham comes to mind, of course, but the same holds true for the many factories we have visited, too. I was sent sincere messages from workers reminiscing difficult times at the Cayadutta Tanning in Gloversville, and the First Prize Center in Albany. Beyond my own interest, knowing that such photos can bring back these memories and emotions is a great incentive. Your photos from Central Warehouse quickly became part of the story when it caught on fire. You say you feel a certain connection to that building. Why? The Central Warehouse was the first abandoned building I explored with my own camera, back in March 2009. A humongous chunk of concrete unlike I had ever seen in France. I experienced a true sense of exploration and excitement there, not unlike exploring an ancient tomb. I brought back eerie pictures and a thirst for more. These photos opened many doors for me. Truth is, I owe a lot of our later adventures, the show at UG and even the book, to my trips to the warehouse. You can't really say it's a beautiful building, but it feels almost dignified to me, after all these years. It was also symbolic of the situation of many similar abandoned places. Known by many, hard to miss, dissed by government officers, too expensive to destroy, too expensive to rehabilitate, what shall we do with them? The pictures I take are not entirely about nostalgia. They may feel like they are looking at the past but they are actually anchored and focused on the present, asking, in a way, "What now?" I see malls popping up left and right. I would like to believe somebody, somewhere, thought about sustainability, questioned what is going to happen in 20, 50, 80 years instead of leaving this problem to our future selves. With that in mind, it felt pretty natural for me to be there when the fire broke out. 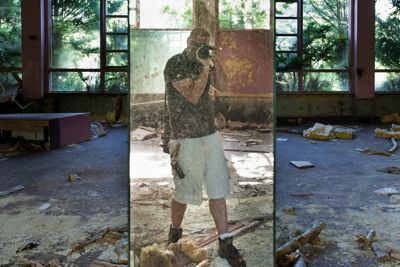 What place would you still like to get into and get photos of? What would you like to see that you haven't? There are many abandoned places left to visit and fun opportunities to get the cuffs, but one high on my list is the Bannerman Castle. I'm longing for good old-fashioned ruins. I have a project in mind involving light painting, in the style of Berthold Steinhilber, but this is not something I want to do illegally and my requests fell short so far. The Historic Albany Foundation released its 2010 list of "endangered" historic buildings around the city, I'm confident my photography friends and I could probably help spread the love. I started scuba diving again last summer and brought a small camera with me. This is not online yet but it was a lot of fun to visit The Lost Radeau, a 250-year-old shipwreck lying in 107 feet of water in Lake George. This looks like a natural extension of the Abandoned Places series and I'll explore this venue in 2011; don't dunk your car in the river for me just yet. I've heard of subterranean and cave networks close to Albany recently, I plan on checking this out, too, and finally meet with the Crab People. I would love to travel more and bring back historical contents, go back to Eastern Europe and venture to India, China and Japan one day. Chernobyl's "Exclusion Zone" is scheduled to open to tourists in 2011, this sounds like a romantic destination. Closer to us and in a very different style, I'm really curious about all the Ghost Towns in the Wild West, such as Bodie, in California. As long as I'm not being chased by Yul Brynner. One reason I like All Over Albany is for the great ideas one can gather all year long from the posts and comments. I'm really open to suggestions. People have contacted me in the past with great plans, feel free to drop me a line. Coming here from France, what is your perspective on the Capital Region? What are some of the important differences that you've noticed? First let me say that there is no such thing as the perfect country. I'm not very patriotic at heart so you won't hear me trash the Capital Region or even the US over France, knowing the little I know about Europe. I had traveled and lived outside France before, and besides being far from my family and disgustingly fresh croissants, I felt welcome here pretty quickly. With that out of the way, I think the biggest difference to me is the urban layout, the "tissue" connecting Albany and its surroundings. It feels a bit... inhuman, mostly meant for commuters, of which I am one. Many suburbs I have lived in or visited feel socially disconnected. What I mean here is that I miss social nexuses -- places where, in any given town, even the tiniest group of, people can gather, sit down, and share something. This sounds clichÃ©, but this is the case in the majority of towns and villages in Frenchland. Picture a small "plaza" next to the town hall, benches, tables outside in front of a cafÃ©, a bakery, an area for kids to play, a well defined, welcoming public space for adults to commingle or argue. I would have loved to find more of that here. Did I read too many Adventures of Asterix? It took me a bit of time to come to peace with the fact that town halls were most likely found in malls. I live in Center Square, but I could live in the suburb if it provided a better way to bring people together. I'm an urbanite, but I was surprised by the poor use of wooded areas, parks, beaches and rivers, too. I was shocked that parks could actually *close*. I'm baffled that so much of the coastal land around Saratoga Lake or Lake George is privately owned. Oh shoot, you are getting me started on private property again. Access to natural resources in France seems a bit easier, and I would have liked to see more bike trails, restaurants and nature-friendly businesses closer to the beautiful rivers and lakes around here. What do you like about the Capital Region? What would you like to change or bring here? I like that everything is so close and up for grabs. The myth that there isn't anything to do in the Capital Region needs to die in a fire. It has been said here before, but Albany is a city that rewards effort. This isn't as daunting as it seems, a small army is already scratching that surface for you. Between Metroland, AOA and Nippertown, the only regret I have is that I can't clone myself. That would drive my friends crazy, though. I have lived in a few major cities like Paris and Berlin, there is an inertia I don't feel subjected to in Albany. It doesn't take me 45 minutes to see my friends, or an hour just to leave town on weekends. There *is* a local music scene, concerts nearby, free shows in the summer, galleries, experimental art and very respectable museums within an hour. Let's not forget cider donut tours, comic cons, waterfalls, nature conservancies right next door, fun sport leagues and opportunities to do good. That's just the tip of my own little iceberg. In other words, there is diversity and ample choices to be part of that game, if you so wish. What would I change? As a personal request, I would like to area to be safer for bicyclists. I was hit hard by a car in 2007, and I know a lot have been less fortunate than me. I'm not trying to parade in my tight shorts while you go blind, I just would like for people to be able to enjoy a healthy, economical or environmentally friendly way to go from point A to point B. More seriously, I am fortunate enough to have a great job and a good living situation. People are struggling right now and I feel a bit helpless. I follow ASAP, Pay it Forward, and Capital District Help Portrait, but I would love to see a website pop up and channel donations or volunteering for the Capital Region specifically. A central hub providing a simple way for people to say, "Here is my project, here is my vision, and here is how you can help or donate." Categorized, dynamic, open for public comments and votes eventually. Hey, "capitalhelp.me" is not even registered. Going back to the difference between this country and France. If there is one thing that is still difficult for me to adjust to *today*, it is to see my American friends struggle with what I took for granted back there. It saddens me to see what people are getting used to and put up with. You shouldn't *ever* have to worry about healthcare. That's just wrong. You shouldn't worry about providing a good education to your kids, either. Festivus is all fun and games, but there is a big picture, right? I'm not asking to burn cars like we do across the Atlantic, but this is the Capital City of New York, I would like to see more people on the streets, strikes, great display of public anger. I can't vote yet, but I can do that with you. There will be more abandoned buildings coming up, most certainly a second book next year (that's fun to make) and a few shows if I find good enough material. I mentioned scuba diving and ship wrecks already, as well as a few trips outside the Capital District. We lost the great Revolution Hall in Troy but I haven't given up on taking pictures of live performances. I used to swing dance, tango and salsa a lot before my accident, and I'd like to get up close and personal with professional dancers (anyone?). Performers and athletes are fascinating, there is so much involvement and raw energy going on that I would like to capture. Are you playing bocce competitively in Washington Park? Let's meet. Grand Street Vacant Lot Project, for example. There is value in bringing different communities together, shedding some light on anything that helps understanding your neighbor. I was unfamiliar with the South End Neighborhood myself. This is not the type of subject traditional media seem to find "spectacular", "emotional" or "entertaining" enough, so I'm glad AOA pointed it out, allowing us to add a little stone to this edifice. Suggestions welcome, too. The national "debate" over whether or not a mosque should be built around Ground Zero got out of hand in my opinion. This is a topic I hope to work on in 2011, one that could benefit from a long-term photo project to help fight misconceptions. I mentioned it before, but photography is a hobby that is getting more affordable every year. You can pick up a small, simple camera for less than $150 and ramp up to a bigger, more sophisticated model as you grow, if needed. There are a lot of better photographers than me in the Capital District. I just make sure my pictures are easy to find, and so can you. Share our vision and have fun. Thanks to All Over Albany for featuring some of my pics over the past few years. I can only hope this helped keep that generous boat afloat, and that it pushed a reader or two to dust off their camera and get excited about little known places, events and communities in the Capital District.
" 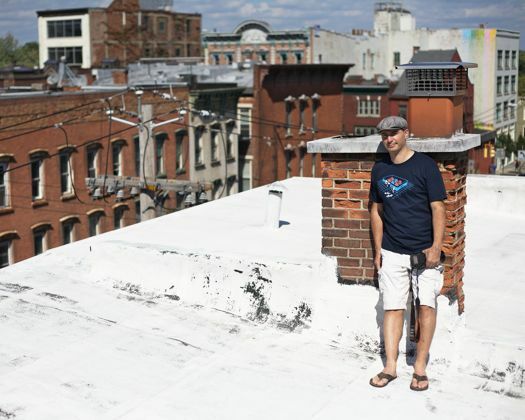 The myth that there isn't anything to do in the Capital Region needs to die in a fire." One of the many reasons Sebastien is awesome. Nice shorts Sebastien, were your manpris in the wash? And that's a great photo overlooking the grape orchard back home, I love it. This was a fun read, Seb had a really productive 2010, 2011 should be fun to watch. It's great to see the output of someone who's put some real thought into what they're doing. Some may scowl at the Sebastien worship on this site, but those people can bugger off. I love the contributions that he's made to this site (and the region) and look forward to more from him in 2011. And can we get a gnome resurrection? No? Great stuff! It's inspiring to see someone move here and be so interested in whats going on. Sebastien knows more about the capital region than many who have been living here their whole lives and luckily has a great ability to share these local tidbits with the rest of us. Living like every day is an adventure (or at least an opportunity for a great photo!) seems like a good way to start the new year. I dont think it's as much people scowling at AOA's obsession with Sebastien on this site as much as it is AOA's allowing someone to self-promote themselves so much. The greatest artists in the world did so because they were obsessed with their art, not themselves. @CommonSense, everyone is allowed a bit of self-promoting so long as they have something valuable to promote. I severely doubt that AOA would feature Sebastien's contributions so often if they weren't worth featuring, which I (for one) think they are. I second what Summer wrote. I can't speak as to how obsessed Sebastien is with his art or whatever Commonsense was getting at (as I doubt he can either) but who cares? Anyone who is scowling about someone's photos being shown is probably just jealous they don't have the self motivation to get off the couch and do something that makes them happy, no matter what that might be. Anyone content with their own hobbies and passions would be pleased to see someone else excel in their own. oh, and nice post, Sebastien. This is very thoughtful writing. Lovely interview. I am so glad that Sebastien Barre is living in our area and sharing his amazing photographs with us. I almost cried - seriously! - over his Tobin's First Prize factory and Central Warehouse photos; he's documenting my family's (and the region's) history in a way I could never hope to. Mr. Fluffy and I both think Sebastien B. clearly is yet another local treasure! (despite what Mother says).